Use the Request to Expedite Payment Letter when you need funds to ensure a project will be able to be completed. quite a bit in law and have a few corporations and LLCs. Your proposal kit is really, really invaluable to me. I have to complement you on the value of your work and the clear understanding and expression of the need that you are fulfilling." This Request to Expedite Payment Letter is included in editable Word format that can be customized in Word or by using the included Wizard software. Re: Request to Expedite Payment on Insert Contract Name or Number. Due to circumstances beyond our control, we have been unable to complete Insert whatever project portion or milestone you have been unable to meet. We are currently experiencing cash flow difficulties that affect our ability to carry on our work. Therefore, we respectfully request that you immediately release a payment of Insert amount or percentage of contract payment requested for the contract named above, leaving amount or percentage remaining due on completion, which will protect you and allow us to efficiently continue operations. Please find attached the invoice for the amount stated above. If you have any questions, please do not hesitate to contact me. On behalf of our entire organization, we thank you in advance for your cooperation and look forward to successful completion of this project. 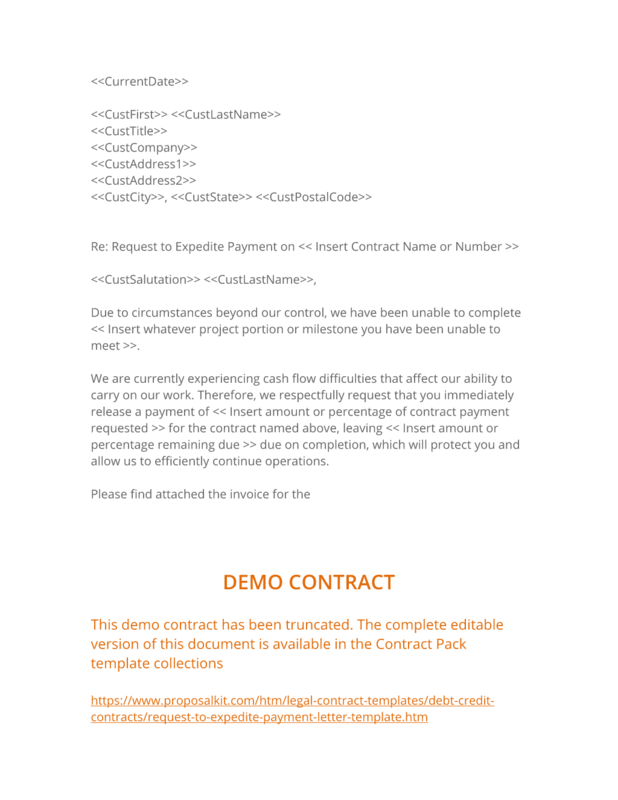 The complete Request to Expedite Payment Letter - with the actual formatting and layout - is available in this Contract Pack.